Everybody knows by now that Shaquille O’Neal took a tumble as he tried to beat Kenny Smith to the video board during the “Inside the NBA” halftime show on the TNT set. And Shaq has been such a good sport about it that he posted a tweet offering $500 to the person who makes the best meme of the fall. After seeing this meme, Shaq offers to pay for the best one. Shaq can laugh at himself as much as the next guy. Although Shaq was happy that Mayweather won the fight against Paquiao, he had no idea that he would be Mayweather’s next contender. Even the slime guy from “Ghost Busters” gets in the contest. Shaq, 2-year-old shooting competition: Future NBA Hall of Famer Shaquille O’Neal recently competed with a 2-year-old Titus Ashby in a shooting competition. 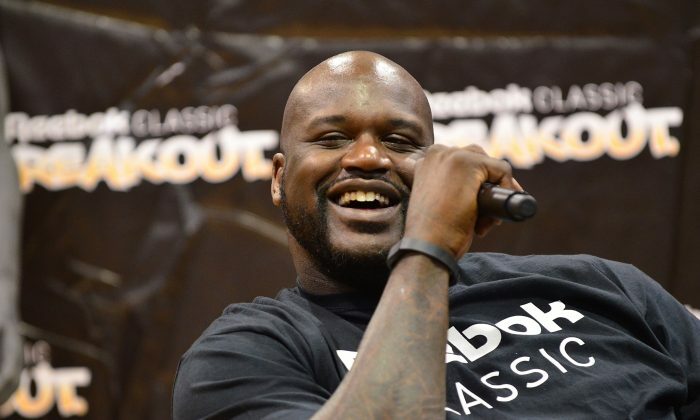 Shaquille O'Neal breaks out in a rap and hopes that Pharrell Williams includes him on the NBA 2K15 soundtrack.